At thisRoma's Hospitality Centre wedding we had two hours allocated for portraits of the bride and groom. As a result, I managed to create a series of visual works of art for the married couple and this is one of them. In this landscape portrait of the bride, the newlyweds are holding hands in the bride is turned towards the groom. Their hands are placed at the bottom left of the frame. The bride's hand and figure are aligned along the baroque diagonal, which gives the image a dynamic feel. 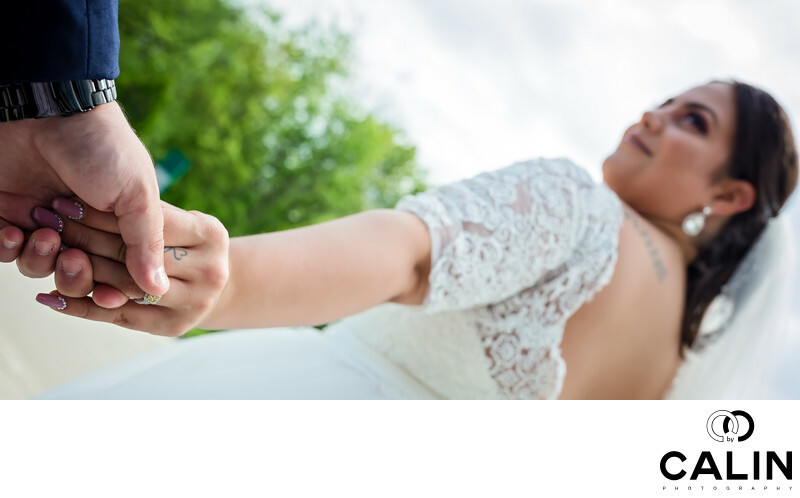 A few elements make this picture stand out: first, we cannot see the groom's face but only his hand, which according to the closure Gestalt principle increases the tension in this image. Also, the focus point of this photograph is the holding hands. Because I shot this with a 35 mm 1.4 lens from a close distance to the hands, the brides face is slightly out of focus. That directs the viewer's eyes towards the hands, the main subject in this image. However as human beings, we are trained to recognize faces so in this frame the viewer starts his journey through the photograph at the bottom left corner then travels along the baroque diagonal towards the brides face. Because she's out of focus, the viewers eye moves back and forth from her face to the holding hands and back to the face in an infinite loop. To emphasize the visual importance of the holding hands, besides the focus point, I added a vignette in post production.